Thanksgiving. What a special time of year. We gather with family and friends, fill up on turkey and stuffing, laugh and remember, and attempt to relax and bask on the many blessings we’ve been given throughout the year. As we look back over the years, we can’t be but extremely grateful for these two things: the beautiful area we are blessed to live in and our wonderful customers - and how great it is they mix. Our awesome customers get to experience the beautiful Emerald Coast daily, and this area is blessed to have amazing businesses that bring life, vitality, diversity and strength of community with them. We couldn’t be more thankful for the beautiful area we call home - Northwest Florida. Serving Pensacola to Marianna, and all areas in between, we get the pleasure of seeing some of the best sights. Arguably, it could be one of the best gems in the United States, but we may be a bit bias. There’s the emerald green waters of the Gulf of Mexico, the sugar white sand beaches, the diverse nature that surrounds the Choctawhatchee Bay, hiking trails and creeks/rivers in the state parks, and wildlife of all kinds from land to sea. That doesn’t even include all of the recreational activities that come along with all of those wonderful assets: hiking, fishing, kayaking, paddleboarding, sightseeing, and relaxing in the sun with your toes in the sand. Add the wonderful culinary experiences, attractions, shopping, golf, and many other adventures this area offers, and we are living in an exquisite, family-friendly, paradise. It wouldn’t be paradise, though, without the wonderful people who bring business, offerings and expertise to the area, and we think our clients are the leaders in this arena. We are so honored to work with businesses in this wonderful area and we are grateful for each of those that have entrusted us with the work and projects we’ve done for them. Each of you brings a slice of something special to this area, and your business, relationships and friendships mean the world to us. We don’t take you or your business for granted, and this Thanksgiving, we are extra thankful for you and that you trust us to help you succeed. -Craig Barrett, Co-Owner of NBI Properties, Inc.. This Thanksgiving, we are expressing our gratitude to all of the businesses we are blessed to work with in this perfect slice of paradise that we get to call home. 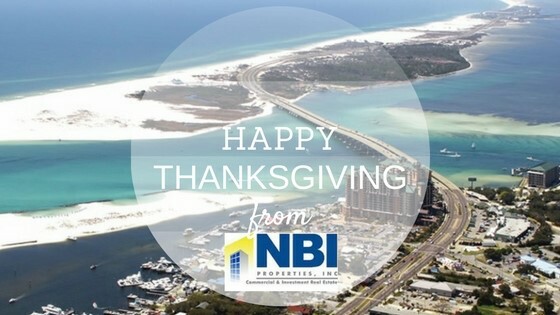 From the NBI Properties, Inc., family to yours, we hope you have a fun, safe and relaxing Thanksgiving! Gobble Gobble!